Bruna Benites Soares is a professional soccer player (defender) from Brazil. In November 2016 she signed with the Houston Dash of the National Women’s Soccer League. 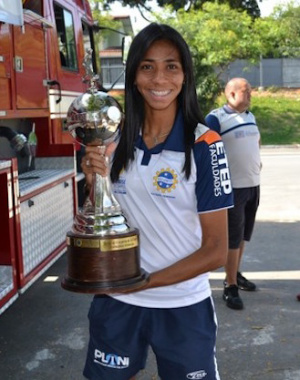 She has also played for Fox Cataratas and Sao Jose in Brazil. She played for one season in 2016 with Avaldsnes. In 2012, she competed in the Summer Olympics on Brazil’s football squad. The team placed fourth in the 2016 Summer Olympics. An injury in May 2015 caused Bruna to miss the 2015 FIFA Women’s World Cup. She suffered a knee injury in May 2017, but returned to play in July 2017. Bruna was born on October 16, 1985, in Cuiaba, Brazil. She is a member of The Church of Jesus Christ of Latter-day Saints. She has a degree in physiotherapy from Universidade Catolica Dom Bosco. This page was last edited on 20 September 2017, at 16:50.